The poet Catullus (c. 84-54 BC) imagines showing off to visitors a toy boat, and listening to it describing in its own voice the journey it could claim to have made from a mountain grove in Asia Minor to its final home in Italy. 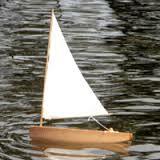 You see, my friends, that little model boat? could beat her using sails and oars combined. on Mount Cytorus, creaking in the air. and in your waves first dipped my little oars. Scholars and readers have long supposed that this charming jeu d’esprit (of which my version in verse is only a slightly loose translation) is about a full-size (boxwood!) yacht that made a real voyage as described, with Catullus on board as its master. In the Latin original underneath I mark in bold some telltale words and phrases which, as part of this cheerfully extravagant ecphrasis, draw the reader’s attention to the more likely interpretation which I argue for in greater detail at the end. novissime hunc ad usque limpidum lacum. 1. Unlike most interpreters, I doubt that Catullus is describing a sea voyage that he ever actually undertook. I suspect that he returned from Bithynia to Italy overland (cf. pedes in C. 46.8 – and humorously implied here by pedem at 21?). If so, he could have brought with him a model boat, or just a block of boxwood (3, trabs) from which he carved a model boat; and the phaselus could then rightly claim that it’s faster than any ship afloat, since even a cart driven by a muleteer (of which more later) travels much faster than a vessel on water. But it isn’t Catullus’s journey that is being described here — this is a poem, not autobiography. The journey is supposedly that experienced by the boat itself, as if it were a miniature Argo (cf. Cat. 64, which begins with a reference to the mythical Argo’s origins as a pine tree). So we might just as well suppose that the narrator is presenting a miniature boat made of Asian boxwood (resting on a delightfully novel and ever-unruffled vitreous surface? – novissime hunc ad usque limpidum lacum, 24) — and then imagining, in the object’s own voice, how it got to Italy. 2. All the seas and places mentioned (Adriatic, Cyclades, Rhodes, Thrace, the Black Sea) would, we are told, love to deny the boat’s prowess in the face of their threats and wildness, but they can’t. The double negative negat…negare (6-7) is a telling piece of devilry: the phaselus never actually had such experiences, but it can deny that they are deniable. 3. (Ait) erum tulisse (19) is easily understood either as ‘(the boat says) it carried its master’ or ‘(the boat says) its master carried it’. J.G. Griffiths pointed out the brilliantly ambiguous switch of subject. The erus need not be the poem’s narrator, nor Catullus himself as is commonly assumed, just whoever the boat imagines transported it from its homeland in Asia Minor. 4. There are parallels for making a sea voyage with a phaselus, but the the notion of Catullus coming home from Asia in a ‘pea-boat’ (phaselos means ‘cowpea’ in Greek, rather than ‘kidney-bean’ as it is usually glossed) with ‘little oars’ (palmulae) across the Adriatic, round the Cyclades etc. (the geography is notoriously problematic)… and then storing his yacht of boxwood (not the right wood for a real boat*) on Lake Garda for visitors to look at (let us suppose them to be Furius and Aurelius)…[* Michael Fontaine reminds me via Twitter (21 Sep 16) that a toy spinning-top (turbo) is glossed volubile buxum at Aeneid 7.382]. 5. If instead one takes the view that this is purely a jeu d’esprit (cf. nugas, C.1.4), it opens up a new literary perspective, that of ecphrasis (which, surprisingly, has rarely been mentioned in this connection). No one supposes that Theocritus describes a real cup in Idyll 1, or Catullus a real coverlet in Poem 64. (Some even doubt the reality of the sparrow in poem 2). Hellenistic poets used visualised objects — real or imagined — to tell a story. This story may be that of Catullus’s happy return to and retirement at Sirmio (cf. Catullus 31), as told through the mouth of a boat — but it needn’t be (Thomson in his commentary even suggests that the whole thing is set in Egypt, and that it draws on a lost Callimachean poem called ‘the yacht of Berenice’ — but hard evidence is lacking). 6. Does it matter, then, whether the phaselus is real or imaginary, or whether we should imagine a full-size boat or a model? In some ways not. But the poem has more point and wit (cf. Cat.16.7 salem ac leporem) if we are supposed to imagine that the poet is imagining himself pointing out to onlookers a model boat (‘ille’ – ‘that one there’) made of Pontic boxwood, and then reporting the boat’s fantasy about its presumed life-cycle and quasi-Odyssean journey to Italy. 7. Catullus is parodying the genre of dedicatory poems, just as Virgil closely parodies this very poem in Catalepton 10, where the subject is the muleteer Sabinus (representing Ventidius Bassus). The dedication here to the Twin Gods (Castor and Pollux, the gods of sailors) is not to be taken literally, any more than the muleteer’s dedication, or Horace’s dedication of his wet clothes to the god (or goddess) of the sea at the end of Odes 1.5. The only significance here is that the boat, like the poem, has come to its final destination. This entry was posted in Classical matters, Poems and versions. Bookmark the permalink.